He was a buck-toothed, stuttering skinny kid from Santa Rosa, California, who at first glance or second seemed to have nothing going for him. 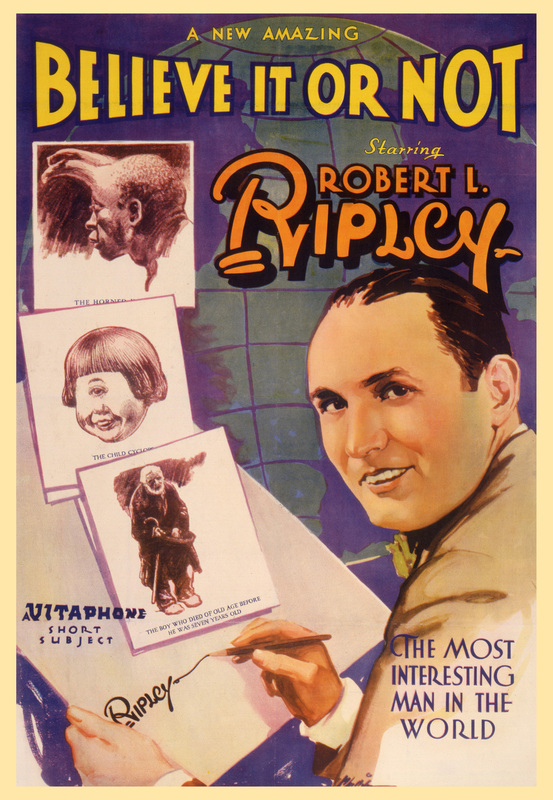 But LeRoy Robert Ripley, born in 1890 on the cusp of the 20th century, did possess at least three important skill sets that would transform his life and that of popular entertainment in the early to mid-20th century and beyond. Ripley loved to draw and had an affinity for cartoons, a talent he parlayed into a successful career at a young age as a sports cartoonist at The Globe in New York City. He had an insatiable interest in the world around him, especially exotic cultures and offbeat lifestyles. And he had the remarkable ability, despite his awkward shyness and stiff camera and radio presence, to continually push the envelope and venture into the latest and most lucrative media venues. “Ripley’s Believe It or Not!” column originated in 1918 during his stint on The Globe, and quickly caught the eye of Richard L. Simon and Max Schuster and publishing mogul William Randolph Hearst, who grew Ripley’s visibility with book and syndication deals and all-expenses paid world travels during which he expanded his popular sports coverage to include illustrated reports on the unusual habits and habitats of the locals he met on his journeys. 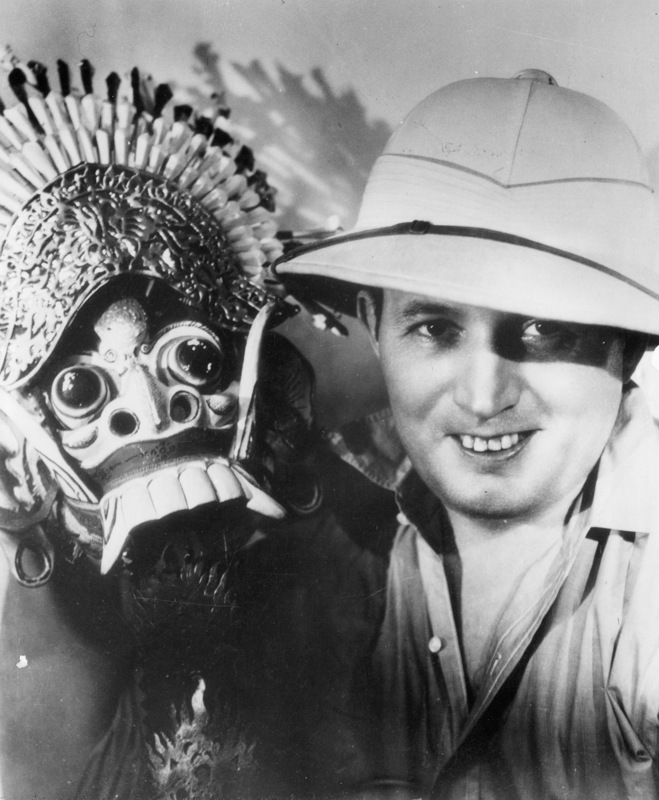 Robert Ripley in his signature pith helmet shows off a Balinese New Year’s Festival Lion mask in 1932. Photo courtesy Ripley Entertainment Inc.
Ripley introduced his quirky finds and adventures to the American public in print as well as in the movies, at the Chicago World’s Fair and in a permanent “museum” on Broadway in New York City. His phenomenal success in those markets led to a much ballyhooed stint on the radio and the launch of his own TV show in 1949 on NBC, also home to every Baby Boomer’s hero Howdy Doody. Remarkably, Ripley’s physical appearance and wardrobe (his buck teeth were shaded by the rim of his pith helmet) and fear of flying never dampened his allure as a ladies man and world traveller. He amassed legions of fans and a fortune. He became a millionaire during the Depression, and his lavish lifestyle assured his status as a front page newsmaker. In Ripley: Believe It or Not, filmmaker Cathleen O’Connell provides a polished, concise narrative that calls to mind the early, hour-long work of Ken Burns. O’Connell incorporates wonderful black and white and color archival footage and photos documenting Ripley’s milieu, travels and exotica. (However, some of his later stars–the guy who eats a live mouse and others who tempt fate with blowtorches and forks on camera–are a bit hard to watch in living color). The examples of Ripley’s sophisticated cartoons are especially eye-popping. 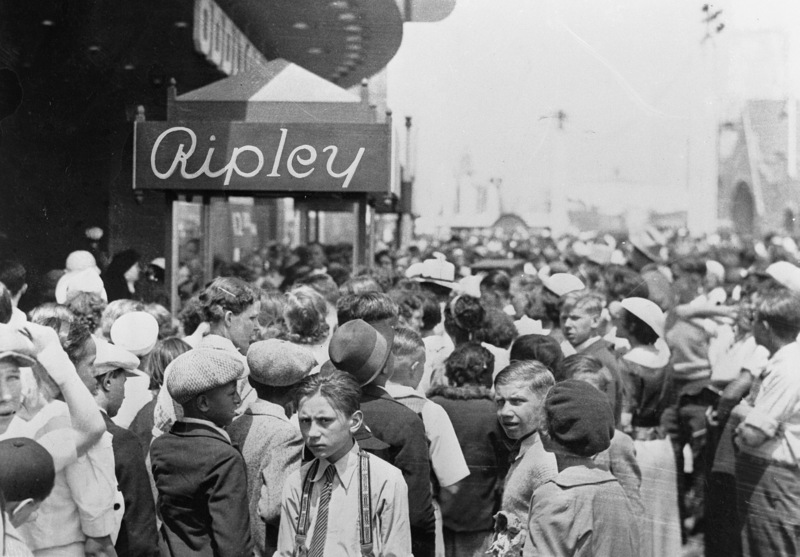 Robert Ripley’s first Odditorium was visited by two million people at the Century of Progress World’s Fair in Chicago 1933-34, and set the stage for six more such exhibits during his lifetime. Photo courtesy Ripley Entertainment Inc. Input from Ripley historians and colleagues is also informative and confirms that the “King of Curiosities” had a heart and social conscience. His fascination with offbeat individuals and locales was born of a need to celebrate the underdog and not by an obsession with the denizens of freak shows or circus sideshows. Ripley’s empathy was driven by his lonely childhood endured as a homely hayseed who was virtually invisible to his peers. His early newspaper cartoon coverage of amazing feats of sportsmanship and his late-in-life focus on World War II heroics and the post-war Atomic bomb devastation in his beloved Far East shined a light on those (soldiers and civilians) whom he felt deserved not to be forgotten. 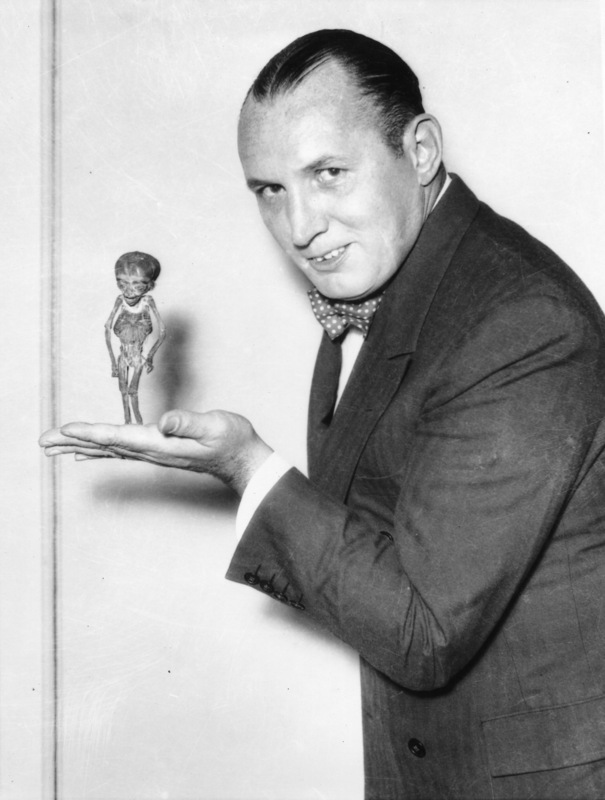 Robert Ripley, circa 1933, with “Atta Boy,” a mummified baby found in Bolivia and believed to have been shrunken by the Shuar Indians of Ecuador. 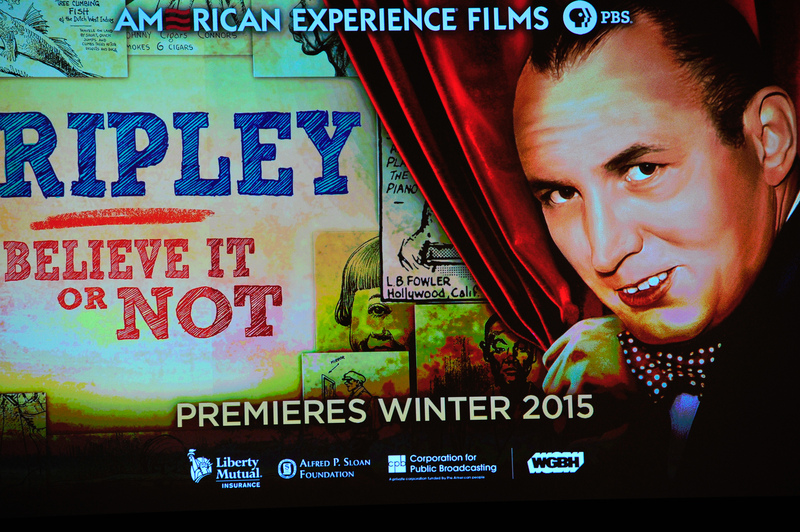 Photo courtesy Ripley Entertainment Inc.
American Experience–Ripley: Believe It or Not is an entertaining introduction to a surprisingly gutsy guy who made it big without good looks but with a nose for fringe dwellers and new technology. That his quirky sensibility continues to live on today, saturating social media, especially YouTube, and such broadcast TV and cable shows as America’s Got Talent, Duck Dynasty and Extreme Homes, to name but a few, is an indication of Ripley’s legacy as a visionary showman. This entry was posted in Film, Radio, TV and tagged America's Got Talent, American Experience: Ripley Believe It or Nor, American Experience: War of the Worlds, Cartoons and Cartoonists, Cathleen O'Connell, Ken Burns, LeRoy Robert Ripley, Odditorium, PBS, Ripley's Believe It or Not!, Simon & Schuster. Bookmark the permalink. This was a fascinating piece- so well written and motivating. Thank you for bringing alive the story of this fascinating man, Ripley. Do you remember a TV series from decades ago called “The Six Million Dollar Man?” Upon reading your post, it suddenly occurred to me that Steve Austin’s biconic arm rubric had embedded in it the acronym for Believe It or Not. Wierd. Anyway, thanks to your timely post, I watched the show. Mr Ripley seemed poignantly sweet, the last thing I would have expected. Glad to hear that you were able to catch and enjoy “Ripley,”Tom! Before I saw this film, I think I’d visited his “museum” on Broadway (the original one) when I was a kid; but I knew nothing about Ripley, the man behind the wacky exhibits. I always assumed he was some kind of freak show aficionado. He was, in fact, a talented cartoonist whose perception of exotic individuals and habitats was that they somehow needed to be exalted. Most amazing to me was that he had the chutzpah and sense of adventure to keep his brand on the move and didn’t let his less than movie star looks and lack of polish deter him from the spotlight. He saw the importance of having a presence in all media, even early TV, which for the time was pretty savvy and bold. The fact that he had a “secret researcher” was, to me, not a negative, but also very savvy and entrepreneurial. I do remember “Six Million Dollar Man,” but your observation about the acronym is really sharp. Thank you for Following my blog! An interesting program. Thanks for the heads up.